The headphone will enjoy a 24 hrs customer service and 12-month warranty! Quickly "Add to your cartle" don't miss out this chance! 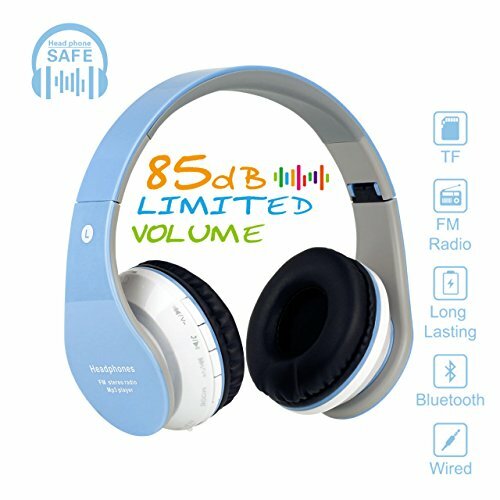 85dB VOLUME LIMITED FOR HEARING PROTECTION: If you are planning to buy headphones for your kids,the safest option is a pair that limits the maximum volume. The volume can be switched from 85dB to 110dB or 110dB to 85dB when press and hold pause/play button 3 seconds. 4 IN 1 MULTIFUNCTIONAL BLUETOOTH HEADPHONES: 8 hrs playtime Bluetooth headphones(handsfreecalling) + TF card music player (Not including TF card) + FM radio + AUX-IN.Your little ones can listen anytime in both a wired and wireless capacity. The wireless design is handy for avoiding tangles,a favorite feature of the big-kid panelists. However, the cord is detachable,minimizing a toddler's risk of getting snagged,the volume reduction of wired headphones is also predictable(low than 85 dB). COMFORTABLE AND COLLAPSIBLE DESIGN: The adjustable headband gives the headphones some impressive flexibility, so they can adapt to the shape of your head for a perfect fit.Soft ear cushions and long-wearingcomfortable without stress,fit for growing teens even adults.It's your kid's great travel partner,let your little ones enjoy the journey without bothering you. HIGH COMPATIBLE WITH MOST DEVICE: Standard 3.5mm audio jack suitable for listening to music or audiobooks. Quickly pairing with mostBluetooth devices device: for iPhone for iPad/ Android Cellphones/ PC and Tablets. Crystal stereo sound-40mm dividers,producehigh-quality sound,createan amazing experience. IDEAL GIFT CHOICE FOR KIDS: It is designed for 3 years old and up children.Made of high quality, durable materials.Also, these headphones are built to last and withstand the rough play of kids. 30 days 100% money back guarantee,18-month replacement warranty,12-hour Customer-friendly Support Service. If you have any questions about this product by Uvital, contact us by completing and submitting the form below. If you are looking for a specif part number, please include it with your message.